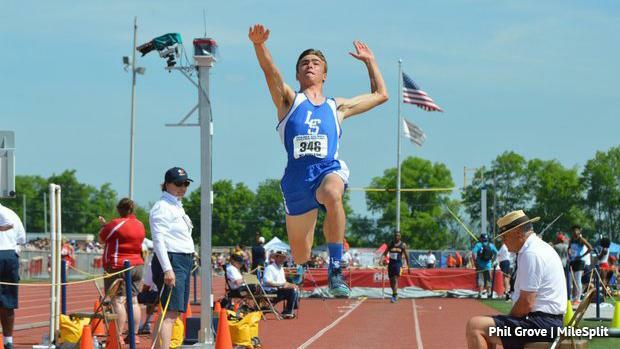 Expect a big year in the boys' long jump in Pennsylvania. After an indoor season that saw him jump to PA No. 2 all-time, Ezra Mellinger of Lampeter-Strasburg will look to add to his resume. He had a breakthrough junior season, but ultimatly he placed tenth in AAA at outdoor states. But this indoor season, Mellinger gained more consistency, eventually jumping 24-11.5, breaking the indoor state meet record. He was second at indoor nationals and could be on pace for an historic outdoor campaign. The top returning jump from last outdoor season, however, comes from Lance Hamilton of State College Area. Hamilton jumped 23-8.75 for the District 6 crown last season. He took sixth at outdoor states and then was seventh at indoor states. His SC teammate Jake Hefkin jumped 23-1 last season and placed seventh at outdoor states. Indoors, he was fourth at states. Both will be major factors this spring. The other returning AAA medalists from last season are Liberty's Javonte Haynes (fifth) and Baldwin's Brendan O'Malley (eighth). Hayes had a big ending to his season last year, ending with strong district and state performances. His Liberty teammate Daeshawn Teague should also be strong this season. O'Malley was third at indoor states and will contend for another high placing outdoors. Upper Perkiomen's Tyrese Reid, Bellefonte's Moryelle Fernandez, McDowell's Caleb Mabins, Delaware Valley's James Lynch, and Spring Grove's Colson Martin are among the other AAA boys to keep an eye on this season. It should get interesting in AA. The one to beat looks to be Hickory's Brian Phillips. He just missed a state medal last season, taking ninth, but he had a strong indoor season, jumping 22-10 before then taking second at indoor states (all classifications). Shenango's Jason Kraner (fifth) and Brookville's Bryan Dworek (seventh) are the only returning AA medalists from a year ago. At 22-8, North Catholic's Joseph Kearney has the top returning jump from last year in AA. Germantown Academy's Kevin Lamb is the top independent schools returner with a best jump of 22-3.75 from last season.